Valsartan tablets are indicated for the treatment of heart failure (NYHA class II-IV). In a controlled clinical trial, valsartan tablets significantly reduced hospitalizations for heart failure. There is no evidence that valsartan tablets provide added benefits when it is used with an adequate dose of an ACE inhibitor [see Clinical Studies (14.2)]. Add 80 mL of Ora-Plus®* oral suspending vehicle to an amber glass bottle containing 8 valsartan tablets 80 mg tablets, and shake for a minimum of 2 minutes. Allow the suspension to stand for a minimum of 1 hour. After the standing time, shake the suspension for a minimum of 1 additional minute. Add 80 mL of Ora-Sweet SF®* oral sweetening vehicle to the bottle and shake the suspension for at least 10 seconds to disperse the ingredients. The suspension is homogenous and can be stored for either up to 30 days at room temperature (below 30°C/86°F) or up to 75 days at refrigerated conditions (2-8°C/35-46°F) in the glass bottle with a child-resistant screw-cap closure. Shake the bottle well (at least 10 seconds) prior to dispensing the suspension. 40 mg are yellow colored, film-coated, oval-shaped tablets debossed with 'RX121' on one side and break line on the other side. 80 mg are yellowish brown colored, film-coated, oval-shaped tablets debossed with 'RX124' on one side and plain on the other side. 160 mg are pink colored, film-coated, oval-shaped tablets debossed with 'RX125' on one side and plain on the other side. 320 mg are brown colored, film-coated, oval-shaped tablets debossed with 'RX126' on one side and plain on the other side. Use of drugs that act on the renin-angiotensin system during the second and third trimesters of pregnancy reduces fetal renal function and increases fetal and neonatal morbidity and death. Resulting oligohydramnios can be associated with fetal lung hypoplasia and skeletal deformations. Potential neonatal adverse effects include skull hypoplasia, anuria, hypotension, renal failure, and death. When pregnancy is detected, discontinue valsartan tablets as soon as possible [see Use in Specific Populations (8.1)]. Excessive hypotension was rarely seen (0.1%) in patients with uncomplicated hypertension treated with valsartan tablets alone. In patients with an activated renin-angiotensin system, such as volume- and/or salt-depleted patients receiving high doses of diuretics, symptomatic hypotension may occur. This condition should be corrected prior to administration of valsartan tablets, or the treatment should start under close medical supervision. Caution should be observed when initiating therapy in patients with heart failure or post-myocardial infarction patients. Patients with heart failure or post-myocardial infarction patients given valsartan tablets commonly have some reduction in blood pressure, but discontinuation of therapy because of continuing symptomatic hypotension usually is not necessary when dosing instructions are followed. In controlled trials in heart failure patients, the incidence of hypotension in valsartan-treated patients was 5.5% compared to 1.8% in placebo-treated patients. In the Valsartan in Acute Myocardial Infarction Trial (VALIANT), hypotension in post-myocardial infarction patients led to permanent discontinuation of therapy in 1.4% of valsartan-treated patients and 0.8% of captopril-treated patients. Changes in renal function including acute renal failure can be caused by drugs that inhibit the renin-angiotensin system and by diuretics. Patients whose renal function may depend in part on the activity of the renin-angiotensin system (e.g., patients with renal artery stenosis, chronic kidney disease, severe congestive heart failure, or volume depletion) may be at particular risk of developing acute renal failure on valsartan tablets. Monitor renal function periodically in these patients. Consider withholding or discontinuing therapy in patients who develop a clinically significant decrease in renal function on valsartan tablets [see Drug Interactions (7)]. Some patients with heart failure have developed increases in potassium. These effects are usually minor and transient, and they are more likely to occur in patients with pre-existing renal impairment. Dosage reduction and/or discontinuation of valsartan tablets may be required [see Adverse Reactions (6.1)]. Valsartan tablets have been evaluated for safety in more than 4,000 patients, including over 400 treated for over 6 months, and more than 160 for over 1 year. Adverse reactions have generally been mild and transient in nature and have only infrequently required discontinuation of therapy. The overall incidence of adverse reactions with valsartan tablets was similar to placebo. The overall frequency of adverse reactions was neither dose-related nor related to gender, age, race, or regimen. Discontinuation of therapy due to side effects was required in 2.3% of valsartan patients and 2.0% of placebo patients. The most common reasons for discontinuation of therapy with valsartan tablets were headache and dizziness. The adverse reactions that occurred in placebo-controlled clinical trials in at least 1% of patients treated with valsartan tablets and at a higher incidence in valsartan (n=2,316) than placebo (n=888) patients included viral infection (3% vs. 2%), fatigue (2% vs. 1%), and abdominal pain (2% vs. 1%). In trials in which valsartan was compared to an ACE inhibitor with or without placebo, the incidence of dry cough was significantly greater in the ACE-inhibitor group (7.9%) than in the groups who received valsartan (2.6%) or placebo (1.5%). In a 129-patient trial limited to patients who had dry cough when they had previously received ACE inhibitors, the incidences of cough in patients who received valsartan, HCTZ, or lisinopril were 20%, 19%, and 69% respectively (p <0.001). Dose-related orthostatic effects were seen in less than 1% of patients. An increase in the incidence of dizziness was observed in patients treated with valsartan tablets 320 mg (8%) compared to 10 to 160 mg (2% to 4%). Valsartan tablets have been used concomitantly with hydrochlorothiazide without evidence of clinically important adverse interactions. Other adverse reactions that occurred in controlled clinical trials of patients treated with valsartan (>0.2% of valsartan patients) are listed below. It cannot be determined whether these events were causally related to valsartan tablets. Valsartan tablets have been evaluated for safety in over 400 pediatric patients aged 6 to 17 years and more than 160 pediatric patients aged 6 months to 5 years. No relevant differences were identified between the adverse experience profile for pediatric patients aged 6 to 16 years and that previously reported for adult patients. Headache and hyperkalemia were the most common adverse events suspected to be study drug-related in older children (6 to 17 years old) and younger children (6 months to 5 years old), respectively. Hyperkalemia was mainly observed in children with underlying renal disease. Neurocognitive and developmental assessment of pediatric patients aged 6 to 16 years revealed no overall clinically relevant adverse impact after treatment with valsartan tablets for up to 1 year. Valsartan tablets are not recommended for pediatric patients under 6 years of age. In a study (n=90) of pediatric patients (1 to 5 years), two deaths and three cases of on-treatment transaminase elevations were seen in the one-year open-label extension phase. These 5 events occurred in a study population in which patients frequently had significant co-morbidities. A causal relationship to valsartan tablets has not been established. In a second study of 6-months duration in 75 children aged 1 to 5 years, there were no deaths; one case of marked liver transaminase elevations occurred following 6 months of treatment. The adverse experience profile of valsartan tablets in heart failure patients was consistent with the pharmacology of the drug and the health status of the patients. In the Valsartan Heart Failure Trial, comparing valsartan in total daily doses up to 320 mg (n=2,506) to placebo (n=2,494), 10% of valsartan patients discontinued for adverse reactions vs. 7% of placebo patients. The safety profile of valsartan tablets were consistent with the pharmacology of the drug and the background diseases, cardiovascular risk factors, and clinical course of patients treated in the post-myocardial infarction setting. 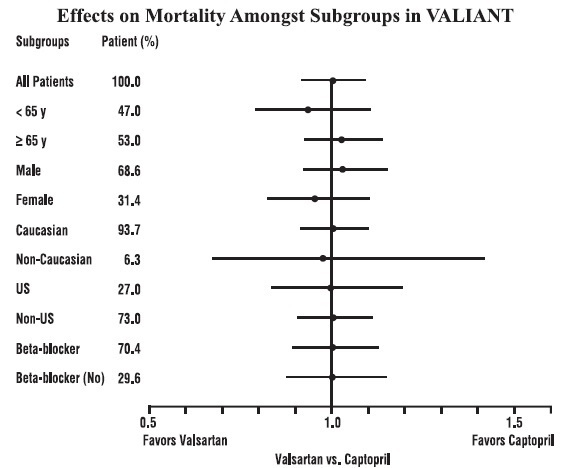 The table shows the percentage of patients discontinued in the valsartan and captopril-treated groups in the Valsartan in Acute Myocardial Infarction Trial (VALIANT) with a rate of at least 0.5% in either of the treatment groups. Discontinuations due to renal dysfunction occurred in 1.1% of valsartan-treated patients and 0.8% of captopril-treated patients. Hypersensitivity: There are rare reports of angioedema. Some of these patients previously experienced angioedema with other drugs including ACE inhibitors. Valsartan tablets should not be re-administered to patients who have had angioedema. No clinically significant pharmacokinetic interactions were observed when valsartan tablets were coadministered with amlodipine, atenolol, cimetidine, digoxin, furosemide, glyburide, hydrochlorothiazide, or indomethacin. The valsartan-atenolol combination was more antihypertensive than either component, but it did not lower the heart rate more than atenolol alone. Dual Blockade of the Renin-Angiotensin System (RAS): Dual blockade of the RAS with angiotensin receptor blockers, ACE inhibitors, or aliskiren is associated with increased risks of hypotension, hyperkalemia, and changes in renal function (including acute renal failure) compared to monotherapy. Most patients receiving the combination of two RAS inhibitors do not obtain any additional benefit compared to monotherapy [see Clinical Trials (14.3)]. In general, avoid combined use of RAS inhibitors. Closely monitor blood pressure, renal function and electrolytes in patients on valsartan tablets and other agents that affect the RAS. Do not coadminister aliskiren with valsartan tablets in patients with diabetes. Avoid use of aliskiren with valsartan tablets in patients with renal impairment (GFR <60 mL/min). Lithium: Increases in serum lithium concentrations and lithium toxicity have been reported during concomitant administration of lithium with angiotensin II receptor antagonists, including valsartan tablets. Monitor serum lithium levels during concomitant use. In controlled clinical trials, clinically important changes in standard laboratory parameters were rarely associated with administration of valsartan tablets. Creatinine: Minor elevations in creatinine occurred in 0.8% of patients taking valsartan tablets and 0.6% given placebo in controlled clinical trials of hypertensive patients. In heart failure trials, greater than 50% increases in creatinine were observed in 3.9% of valsartan-treated patients compared to 0.9% of placebo-treated patients. In post-myocardial infarction patients, doubling of serum creatinine was observed in 4.2% of valsartan-treated patients and 3.4% of captopril-treated patients. Hemoglobin and Hematocrit: Greater than 20% decreases in hemoglobin and hematocrit were observed in 0.4% and 0.8%, respectively, of valsartan tablets patients, compared with 0.1% and 0.1% in placebo-treated patients. One valsartan patient discontinued treatment for microcytic anemia. Liver Function Tests: Occasional elevations (greater than 150%) of liver chemistries occurred in valsartan tablets-treated patients. Three patients (<0.1%) treated with valsartan discontinued treatment for elevated liver chemistries. Neutropenia: Neutropenia was observed in 1.9% of patients treated with valsartan tablets and 0.8% of patients treated with placebo. Serum Potassium: In hypertensive patients, greater than 20% increases in serum potassium were observed in 4.4% of valsartan tablets-treated patients compared to 2.9% of placebo-treated patients. In heart failure patients, greater than 20% increases in serum potassium were observed in 10.0% of valsartan tablets-treated patients compared to 5.1% of placebo-treated patients. Blood Urea Nitrogen (BUN): In heart failure trials, greater than 50% increases in BUN were observed in 16.6% of valsartan tablets-treated patients compared to 6.3% of placebo-treated patients. Use of drugs that act on the renin-angiotensin system during the second and third trimesters of pregnancy reduces fetal renal function and increases fetal and neonatal morbidity and death. Resulting oligohydramnios can be associated with fetal lung hypoplasia and skeletal deformations. Potential neonatal adverse effects include skull hypoplasia, anuria, hypotension, renal failure, and death. When pregnancy is detected, discontinue valsartan tablets as soon as possible. These adverse outcomes are usually associated with use of these drugs in the second and third trimesters of pregnancy. Most epidemiologic studies examining fetal abnormalities after exposure to antihypertensive use in the first trimester have not distinguished drugs affecting the renin-angiotensin system from other antihypertensive agents. Appropriate management of maternal hypertension during pregnancy is important to optimize outcomes for both mother and fetus. In the unusual case that there is no appropriate alternative to therapy with drugs affecting the renin-angiotensin system for a particular patient, apprise the mother of the potential risk to the fetus. Perform serial ultrasound examinations to assess the intra-amniotic environment. If oligohydramnios is observed, discontinue valsartan tablets, unless it is considered lifesaving for the mother. Fetal testing may be appropriate, based on the week of pregnancy. Patients and physicians should be aware, however, that oligohydramnios may not appear until after the fetus has sustained irreversible injury. Closely observe infants with histories of in utero exposure to valsartan tablets for hypotension, oliguria, and hyperkalemia [see Use in Specific Populations (8.4)]. It is not known whether valsartan tablets are excreted in human milk. Valsartan tablets were excreted in the milk of lactating rats; however, animal breast milk drug levels may not accurately reflect human breast milk levels. Because many drugs are excreted into human milk and because of the potential for adverse reactions in nursing infants from valsartan tablets, a decision should be made whether to discontinue nursing or discontinue the drug, taking into account the importance of the drug to the mother. The antihypertensive effects of valsartan tablets have been evaluated in two randomized, double-blind clinical studies in pediatric patients from 1 to 5 and 6 to 16 years of age [see Clinical Studies (14.1)]. The pharmacokinetics of valsartan tablets have been evaluated in pediatric patients 1 to 16 years of age [see Pharmacokinetics, Special Populations, Pediatric (12.3)]. Valsartan tablets were generally well tolerated in children 6 to 16 years and the adverse experience profile was similar to that described for adults. Valsartan tablets are not recommended for pediatric patients under 6 years of age due to safety findings for which a relationship to treatment could not be excluded [see Adverse Reactions, Pediatric Hypertension (6.1)]. There is limited clinical experience with valsartan tablets in pediatric patients with mild to moderate hepatic impairment [see Warnings and Precautions (5.3)]. Safety and effectiveness of valsartan tablets in patients with severe renal impairment (CrCl ≤30 mL/min) have not been established. No dose adjustment is required in patients with mild (CrCl 60 to 90 mL/min) or moderate (CrCl 30 to 60 mL/min) renal impairment. Valsartan tablets are not removed from the plasma by hemodialysis. Valsartan tablets, USP are a nonpeptide, orally active, and specific angiotensin II receptor blocker acting on the AT1 receptor subtype. Angiotensin II is formed from angiotensin I in a reaction catalyzed by angiotensin-converting enzyme (ACE, kininase II). 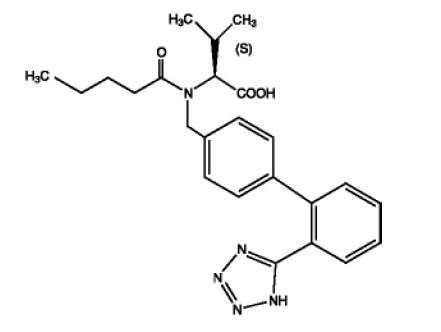 Angiotensin II is the principal pressor agent of the renin-angiotensin system, with effects that include vasoconstriction, stimulation of synthesis and release of aldosterone, cardiac stimulation, and renal reabsorption of sodium. Valsartan tablets block the vasoconstrictor and aldosterone-secreting effects of angiotensin II by selectively blocking the binding of angiotensin II to the AT1 receptor in many tissues, such as vascular smooth muscle and the adrenal gland. Its action is therefore independent of the pathways for angiotensin II synthesis. Valsartan peak plasma concentration is reached 2 to 4 hours after dosing. Valsartan shows bi-exponential decay kinetics following intravenous administration, with an average elimination half-life of about 6 hours. Absolute bioavailability for valsartan tablets is about 25% (range 10% to 35%). The bioavailability of the suspension [see Dosage and Administration; Pediatric Hypertension (2.2)] is 1.6 times greater than with the tablet. With the tablet, food decreases the exposure (as measured by AUC) to valsartan by about 40% and peak plasma concentration (Cmax) by about 50%. AUC and Cmax values of valsartan increase approximately linearly with increasing dose over the clinical dosing range. Valsartan does not accumulate appreciably in plasma following repeated administration. Pediatric: In a study of pediatric hypertensive patients (n=26, 1 to 16 years of age) given single doses of a suspension of valsartan tablets (mean: 0.9 to 2 mg/kg), the clearance (L/h/kg) of valsartan for children was similar to that of adults receiving the same formulation. The antihypertensive effects of valsartan tablets were demonstrated principally in 7 placebo-controlled, 4- to 12-week trials (1 in patients over 65 years) of dosages from 10 to 320 mg/day in patients with baseline diastolic blood pressures of 95 to 115 mmHg. The studies allowed comparison of once-daily and twice-daily regimens of 160 mg/day; comparison of peak and trough effects; comparison (in pooled data) of response by gender, age, and race; and evaluation of incremental effects of hydrochlorothiazide. In most patients, after administration of a single oral dose, onset of antihypertensive activity occurs at approximately 2 hours, and maximum reduction of blood pressure is achieved within 6 hours. The antihypertensive effect persists for 24 hours after dosing, but there is a decrease from peak effect at lower doses (40 mg) presumably reflecting loss of inhibition of angiotensin II. At higher doses, however (160 mg), there is little difference in peak and trough effect. During repeated dosing, the reduction in blood pressure with any dose is substantially present within 2 weeks, and maximal reduction is generally attained after 4 weeks. In long-term follow-up studies (without placebo control), the effect of valsartan appeared to be maintained for up to 2 years. The antihypertensive effect is independent of age, gender or race. The latter finding regarding race is based on pooled data and should be viewed with caution, because antihypertensive drugs that affect the renin-angiotensin system (that is, ACE inhibitors and angiotensin-II blockers) have generally been found to be less effective in low-renin hypertensives (frequently blacks) than in high-renin hypertensives (frequently whites). In pooled, randomized, controlled trials of valsartan tablets that included a total of 140 blacks and 830 whites, valsartan and an ACE-inhibitor control were generally at least as effective in blacks as whites. The explanation for this difference from previous findings is unclear. The 7 studies of valsartan monotherapy included over 2,000 patients randomized to various doses of valsartan and about 800 patients randomized to placebo. Doses below 80 mg were not consistently distinguished from those of placebo at trough, but doses of 80, 160 and 320 mg produced dose-related decreases in systolic and diastolic blood pressure, with the difference from placebo of approximately 6 to 9/3 to 5 mmHg at 80 to 160 mg and 9/6 mmHg at 320 mg. In a controlled trial the addition of HCTZ to valsartan 80 mg resulted in additional lowering of systolic and diastolic blood pressure by approximately 6/3 and 12/5 mmHg for 12.5 and 25 mg of HCTZ, respectively, compared to valsartan 80 mg alone. There are no trials of valsartan tablets demonstrating reductions in cardiovascular risk in patients with hypertension, but at least one pharmacologically similar drug has demonstrated such benefits. The antihypertensive effects of valsartan tablets were evaluated in two randomized, double-blind clinical studies. Valsartan tablets, USP are available as tablets containing valsartan 40 mg, 80 mg, 160 mg, or 320 mg. All strengths are packaged in bottles as described below. Store at 20o to 25o C (68o to 77o F) [See USP Controlled Room Temperature]. Pregnancy: Female patients of childbearing age should be told about the consequences of exposure to valsartan tablets during pregnancy. Discuss treatment options with women planning to become pregnant. Patients should be asked to report pregnancies to their physicians as soon as possible. All trademarks of the property of their respective owners. Tell your doctor if you get any side effect that bothers you or that does not go away. These are not all the possible side effects of valsartan tablets. For a complete list, ask your doctor or pharmacist. Store valsartan tablets at room temperature between 68º to 77º F (20º to 25º C). For more information about valsartan tablets, ask your pharmacist or doctor, or call 1-800-818-4555. Inactive ingredients: colloidal silicon dioxide, crospovidone, hypromellose, ferric oxide black (in 160 mg and 320 mg strength), ferric oxide red (in 80 mg, 160 mg, and 320 mg strength), ferric oxide yellow (in 40 mg, 80 mg, and 320 mg strength), magnesium stearate, microcrystalline cellulose, pregelatinized starch, polyethylene glycol, talc, and titanium dioxide.